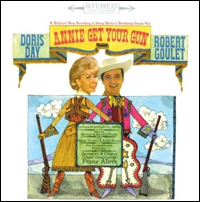 A vintage studio cast recording of Irving Berlin's Annie Get Your Gun — featuring Doris Day and Robert Goulet — will be released on the DRG Records label March 4. The original album, produced by Goddard Lieberson and Irving Townsend for Columbia Records, was recorded in 1963. The recording featured orchestrations by Phil Lang and a full orchestra and chorus under the direction of Franz Allers. "Who Do You Love I Hope?" The original production of Annie Get Your Gun — featuring a score by Irving Berlin and a book by Herbert and Dorothy Fields — opened at the Imperial Theatre in May 1946, playing 1,147 performances before closing Feb. 12, 1949. Ethel Merman and Ray Middleton starred. The most recent Broadway production — March 1999-Sept. 2001 — cast Bernadette Peters as Annie Oakley. Peters won her second Tony Award for her performance opposite Tom Wopat's Frank Butler. The Berlin score features such classic tunes as "There's No Business Like Show Business," "They Say It's Wonderful," "You Can't Get a Man with a Gun" and "I Got Lost in His Arms." Other upcoming releases on the DRG label include "Judy Garland at the Grove" and the original Broadway cast recording of Say, Darling; both will also arrive March 4.